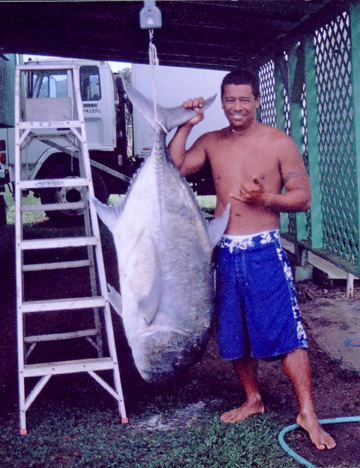 Randall Elarco was on a Memorial weekend outing with his family on the North Kohala Coast on the Big Island when he took a strike at 7 a.m. After a 30-minute fight using his 13-foot Nitro pole and 6/0 Penn reel, the ulua tired and surfaced. The family scrambled down from the cliff and managed to secure the ulua and haul it up. The big surprise was that Randall caught his ulua using a barbless ulua hook!